We did say never again but well our arm was twisted and it is all in a good cause! We are hosting another dinner on the roof of Yalding Church… in fact we are inviting 20 couples to come along for a Paella themed supper and on the night there will be a further prize draw and three couple will be invited to partake of their dinner on the roof! It will be a fun night and the whole raison d’etre is to help this charity raise much needed funds to continue its support of the upkeep of the fabric of this building and hub of the village community. Just remember it could be dinner on a “hot lead roof” with a great view and some fascinating company so just get donating! The day started with my Swiss friends managing firstly at getting lost with their Sat Nav and arriving somewhat late for a hastily arranged private tea tasting… It was one of my friends who is something of a tea fanatic and I thought what could be more unique than arrange a private tea tasting courtesy of master tea blender Alex Probyn of Shoreham based tea company Blends for Friends. Alex has grown his business at a phenomenal rate over the last few years and what intially was a tea blending for individual customers is now by something of a monolithic giant in bespoke tea companies. He blends brews for clients around the globe from 5 star hotels to even other tea companies. We arrived late but Alex warmly greeted us all and we got stuck into a quick (by Alex’s standards) tutorial on the differing types of tea. Well a good hour later after a tutored tasting and a very informative tour of his set up we left with some great tea blends and more importantly I left with a supply of specially blended tea ready for the Vicars Picnic scheduled for August 30th in Yalding! The Vicars Picnic Blend is a mix of three teas… Indian Assam, Sri Lankan Dimbula and a Chinese Yunnan… it is a fruity flavour in the style of an English Breakfast Tea that will go well with the planned scones, jam and clotted cream! 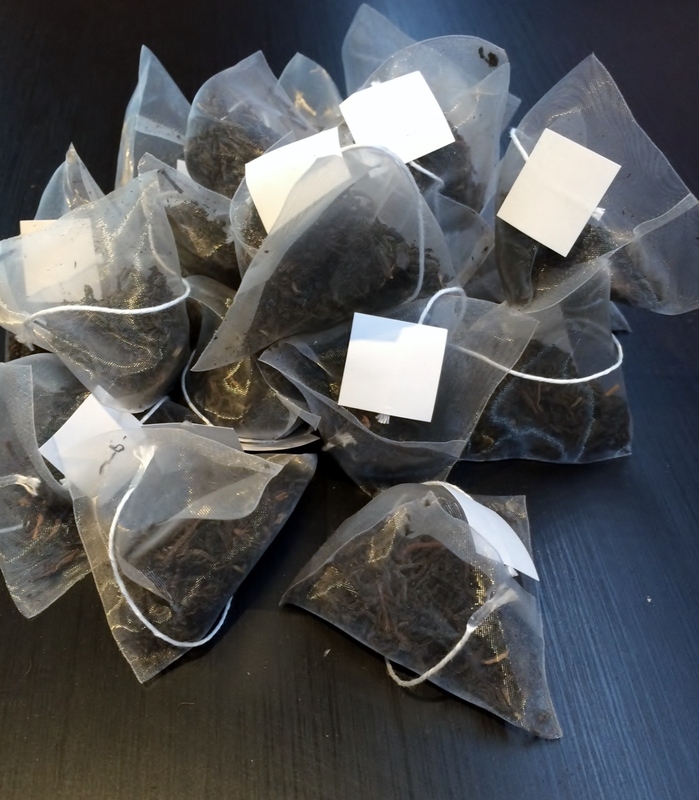 The tea will be also on sale in retail packs to take home as well so you can have a lasting memory of the day! Well what a year this has been… we can safely say it has been a vintage year of events and fun and well we thought it might be worth a look back at some of the highlights. Well January 2012 was the start and we did a dinner at a new location… Olive Stores in Brenchley provided the backdrop for a Veggie Feast dinner in conjunction with Moodley’s Micro Brewery where we did a 6 course vegetarian menu matched to Yudhistra Moodleys rather special beers. It was a challenge to provide a balanced menu to the beers but we think it went rather well with some lovely comments in our guest book! February marked the celebration of our second birthday of existence and we felt we celebrated in style with a “Birthday Bash” that was extravagant with some of my favourite dishes. Namely some Fresh Foie Gras and also a rather juicy double sirloin steak topped with bone marrow. We had one group of guests travel all the way from Oxford for the occasion and it was yet again another couple of fun filled nights. We also shot a little video to help promote our first little charity fundraiser of the year. “Eat like a King well almost” was an event we had donated to one of our favourite charities the Hospice in the Weald. Their torchlight Dinner held at Hever Castle was a fitting setting for our video that we shot on a cold February morning with snow all around. The video also helped us raise a total of £2,200 so all rather humbling. March dashed by and as the year hotted up we started planning some of our next events the Spring menus saw us cooking some rather tasty lamb chumps with the freshly foraged wild garlic and then a couple of forays with meals out were interesting fodder for the blog as the experiences were chalk and cheese. Rocksalt in Folkestone was a disaster and then Pollen Street Social in London was a real triumph! Our May dinners saw us back at the Olive Stores in Brenchley with the patriotic feel of Best of British Dinners. 2012 has been a year of British celebrations what with the Queens Diamond Jubilee and then the Olympic and Paralympics games. Well the Best of British Dinners were a challenge where we produced two four course dinners from a minute kitchen. It was however a pleasure to serve up some great local asparagus and strawberries and then a main course of pigs cheeks and pork belly provided an interesting talking point. Our next charity challenge then quickly loomed upon us in June when on the eve of the Summer Solstice we took our underground “covert” dining to new heights when we attempted to serve a dinner to six prize draw winners on the roof of Yalding’s 13th century church. The Yalding Church Preservation Society (YCPS) had asked us if we would help them raise some much needed funds for their remit of assisting in the upkeep of this village church and we rose to the challenge. An online and offline collection was made and a total of just over £1500 was raised. Six lucky diners tucked into a dinner on the roof whilst 50 plus enjoyed canapés and drinks in the churchyard at the same time. Phew what a week! Finally just before our summer break we served our July dinners with a French theme and then like the rest of the nation we got hooked on the sporting festival that took place up in London. I was fortunate to have several visits to the Olympic park and was also pleased to be at the opening day of a new restaurant (Danes Yard Kitchen) located a stones throw across the road from the park and have since been back a few times and watch with interest how the place evolves. We conducted our normal Xmas feast and also tried a new little venture of Covert cookery lessons with our first recipient just before Xmas looking to pick up some tips on how to produce some interesting dishes for the festive period. It has been a busy year and already we are planning our events for 2013. The 2013 dates are already published and we have menus for the first three months in the pipeline so keep an eye out for them . The bookings for January will open on January 1st and it will be what we call our “January Sale”. We will also hopefully be looking at doing some bigger events during 2013 and also revisiting some old haunts. Olive Stores are expanding and we hope we can do something new and exciting with them in their latest venue. We have more meals out planned which we hope to report upon and then also the Covert Cookery lesson idea will expand so do keep watching this space or sign up on our database for regular updates. We wish you all the best for 2013 and many thanks for your patronage and support during 2012 – a truly vintage year! Thanks…it is an amazing total.. Many thanks to all who took part and donated and we are in the process of notifying all winners. The total raised was £1,119.00 from both online and offline donations. We will now be putting final touches to the evening and we will post a full report once the evening has been completed! It has been a mammoth task to raise this amount and without the support of so many generous donations we could not have achieved it. Please do spread the word about the night and also the charity YCPS… they might be a small one but the work they do is nonetheless still as important. Well we are just a few hours away from the chance to take “Underground Dining” to new heights. You have until just 12 Midnight on Saturday June 2nd to make your online donations. Thereafter the only way to get your name in the “Virtual Hat” will be to make a direct donation at the Diamond Jubilee celebrations on Sunday June 3rd at the Yalding Lees. This has been a mammoth task in terms of planning and permissions. In fact when I first approached the charity I am supporting in this endeavour over a year ago it was met with some scepticism as to if we could achieve it. We have had to jump through hoops and work hard to convince so many that the intentions to help raise the profile of this worthwhile charity and have a fun night in the process is all we are trying to do! This will be a “once only” chance to dine on the roof of this charming village church. It will not happen again as I have possibly aged somewhat in this process! We still need you to donate as the target is not yet in sight! So please go to my online donation page… please do donate what you can and your name will then be placed in that hat. Thanks to all those who have already embraced the event. I know the YCPS are very grateful for your support and hope this has fired your imagination to continue support them in their future fundraising! I know we aim to, but just not on the church roof! P.S. Spaces still available for our Hot little Sizzler on June 16th – go to our Book Now page to reserve your place! Well it is but a few more weeks until the draw will take place for our biggest challenge yet. 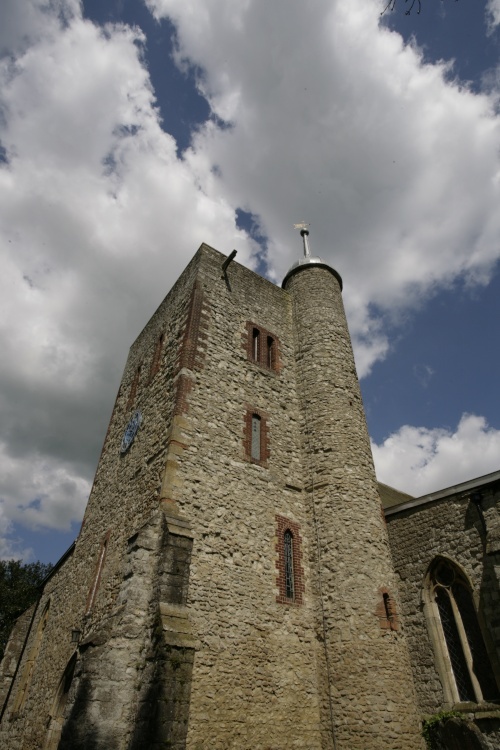 The “Tower Dinner” as it has become known as will take place on the evening of Saturday June 23rd. We are asking for a donation of just £1 to get your name in our virtual hat that will then enable your name to be placed within the draw to be a guest at this very special event. We will be serving a five course dinner to guests on top of the 13th century roof of St Peter & St Paul Church in the centre of Yalding. This flat roofed church has a wonderful heritage and when yours truly was asked to help the YCPS (Yalding Church Preservation Society) to assist in a charity fundraising event then we could not resist! The YCPS are tasked with raising monies to help maintain this building and like many charities they struggle to raise sufficient funds especially with so many worthwhile local causes. So with our involvement it has been a challenge to spread the word further and wider but at the same time give the public the chance to partake in something that will be very unique. It has taken many months of planning and cajoling to get the relevant permissions (something as an underground/secret eatery we are unaccustomed to) and now we need more people to sign up for what will be a once in a lifetime chance to dine in a very unique and magical spot. The roof commands some stunning views of the hills and countryside around the village and what better way to see the sun set on what we hope will be a warm and barmy evening than relaxing on the roof with fellow diners. In total 3 lucky pairs will be winners of the draw that will mount the stairs to the roof and will then sit down for a sumptuous meal (see menu below) However as this will be a very special night we will draw a further 25 names from the hat and they will be invited to attend as guests of the YCPS to be at a special drinks and canapé reception that will take place within the churchyard. So why not give it a go yourself or if you cannot make it then please spread the word to all your friends, family and social networks.. we do have a target we are hoping to raise and the more that know about this very unique night the better. It will not happen again so remember this is your one and only chance to take underground dining to new heights! Following the welcome arrival drink and assorted nibbles in the churchyard at 8pm the draw winners will be invited to mount the stairs to sit at a communal table on the roof and watch the sunset as they eat their meal. Please note menu is subject to market purchases and alteration. If you wish to donate to be in with a chance to dine on the roof than please go to our on line donation page here. Donations made up to 12pm (Midnight) on June 2nd will be entered into the draw. Donations made online after this deadline will not count. Alternatively you can make an offline donation on Saturday May 19th at the Yalding Farmers Market 10am -1pm where YCPS trustees will be an attendance for this purpose or finally on Sunday June 3rd at the Diamond Jubilee celebrations in Yalding on the Lees. This will be the last chance for taking donations directly before the draw is made that day. Time is still to be confirmed. Good Luck to all and thank you for your support and generosity… keep spreading the word! Back last year I was approached by Yalding Church Preservation Society (YCPS) a registered charity that is tasked with assisting in the upkeep of the fabric of the building of St Peter & St Paul’s Church in the village centre of Yalding to perhaps host a special dinner for them. I have since been trying to see how best we could assist in their fundraising and help them in a novel and memorable way. Well we have already physically done a dinner underground … now we will be attempting to do a dinner above ground… well above ground. 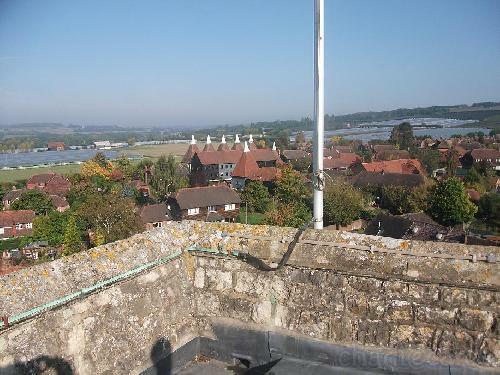 In fact we can get no higher than on its roof or to be precise at the top of its tower. Following much negotiation with all relevant parties we can now reveal that this one off event will take place on Midsummer’s Eve namely Saturday 23rd June 2012 when in conjunction with the YCPS we will be hosting a very special dinner on the top of St Peter & St Paul’s Church Yalding… six lucky guests will sit down to a sumptuous four-course meal on what we hope will be a warm and sultry summer’s evening with a view to die for! So how do you book your places? Well, we thought for such a unique dining opportunity we would make this different and a fun way whilst raising some much needed funds to ensure the upkeep of this village’s heritage. So we have set up a specific fundraising page here that will be helping to raise much needed funds for the continued maintenance of the church. Fundraising today is very challenging and also competitive for so many worthwhile causes. You will also be aware we do like to do our bit to help so we thought this would be a great way to assist the YCPS in what we hope is an unusual and imaginative way. So how will it all work? Well, for every £1 donated your name will be put into a virtual hat. So for a £10 donation it will mean your name will be in the draw ten times…then for £50 it will be fifty times! Please note if you should donate anonymously your name will still be entered into the draw unless you state otherwise. When we make the draw (date and place to be confirmed soon) the first three names will then be invited to attend with a friend/partner as our guests to the sumptuous and unusual dinner at the top of the tower. For this very unique chance to take our covert dining to a new level there are however a few conditions to ensure our diners’ safety. All participants will need to be over 18 years of age. All participants to the dinner on the tower will also be required to sign a disclaimer that they are mounting the tower at their own risk. You will also be supervised at all times for your own safety. If weather is bad (heavy rain and wind) the event/dinner will be transferred to a location inside the church itself. As this is such a unique event we also felt we should celebrate in style with as many as possible so the dinner will be preceded by a special reception beforehand. Therefore after the initial 3 names drawn a further 25 names will be drawn from the virtual hat and invited with their chosen guest to attend a special private drinks and canapé reception hosted by the YCPS in the churchyard. So all in all a very unusual event that we hope will not only help raise some funds for the continued repairs to the fabric of the building but also give six lucky people a very unique and memorable dining experience. Then a further fifty will share in the evening’s celebrations. More details on what will be happening on this evening will be published in due course. So please do donate now, as much as you feel you can. Do also spread the word as well as this is too special, intriguing and a challenging event not to share! We hope you will partake in this special event and we look forward to helping this small but very important community charity!